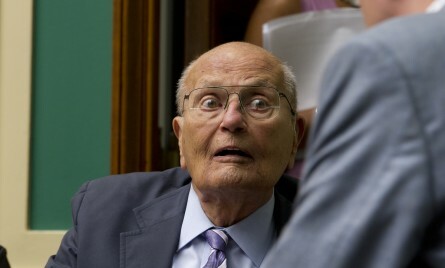 Rep. John Dingell, D-Mich., released his annual "Dingell Jingle," a lyrical gift rife with potshots, holiday jeer and even the acronym "YOLO." Parodying the poem "A visit from St. Nicholas," the longest serving member of Congress penned a rhyming condemnation of the 2013 government shutdown spanning a full eight stanzas. Here&apos;s one poetic nugget of how the Dean felt about this year: "And so rhetoric flared, rich with words set to rile them/ As the inmates controlled the Congressional asylum." "We will no-way, no-how raise that federal debt ceiling! Make concessions on revenue? That’s simply unappealing!" “Let’s vote forty-six times! Roll the ACA back!" “We’ll repeal and replace!” …but replace it with what? “But that website, atrocious! Cancellations, how scary! And all this the fault of that Socialist, Barry! We don’t need a solution! Just delay it! Delay! Bring the Secretary here! We can ask her some questions! Joe Barton brought Powerpoints! And YouTube! And charts! Yes, the website had flaws, marred with errors and glitches. But costs no longer soared for a wheelchair or stitches. Got kids? They’ll be covered ‘til age 26. Caps on coverage for care? Preexisting conditions? Why, we&apos;ve solved those two, too, though we&apos;re just politicians. Do you remember what that is? And recall what it means? It helped build this great country, it’s our bedrock, our ground. So Happy Holidays friends, and a blessing to all.